Welcome to Fish Window Cleaning! 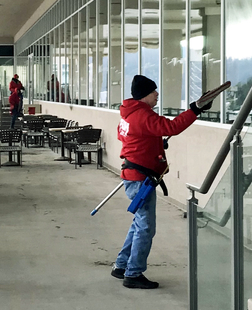 We are your local window cleaning company for the Pittsburgh South Hills area including Washington, Canonsburg, Houston, Peters Township, McMurray, Venetia, Strabane, Bridgeville, Bethel Park, and Upper St. Clair, PA.
At Fish Window Cleaning, we strive to provide our customers with perfect cleanliness, as well as perfect peace of mind. We are committed to customer satisfaction. We train our uniformed cleaners to provide excellent customer service, equip them with the best tools and expertise in the industry, and deal fairly and honestly with our customers every single day. Fish Window Cleaning pledges to provide superior service to each of our Commercial and Residential customers. We are committed to customer satisfaction. If it’s not right, we’ll make it right. If your world isn’t bright, neither is ours. 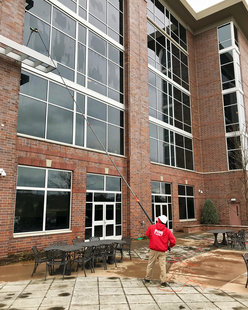 Clean sparkling windows can help your home or business make a good first impression, and nobody does a more professional, thorough window cleaning job than FISH. We are committed to your satisfaction. 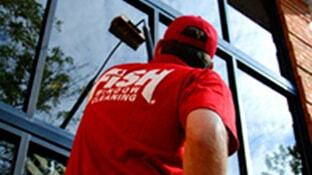 FISH is the world’s largest window cleaning company, and we are your local FISH representatives. We don’t use subcontractors. We do use the best equipment and products available including our patented FISH Foam window cleaner. You can rely on Fish Window Cleaning to take the utmost care of your business and residence in the Pittsburgh area as we clean your windows…we are there for you!...We maintain storefronts and commercial buildings in the South Hills area…You will find us providing service to retailers and restaurants in some of these areas; Washington, Canonsburg, Houston, Peters Township, McMurray, Venetia, North Strabane, South Strabane, Bridgeville, Bethel Park and Upper St. Clair. We make your business SHINE!